Namkhé Nyingpo (Tib. ནམ་མཁའི་སྙིང་པོ་, Wyl. nam mkha'i snying po) (8th-9th century) — one of the twenty-five disciples of Guru Rinpoche. Namkhé Nyingpo was exiled by ill-willed ministers, and thus settled at Lhodrak Kharchu (Tib. Lho brag khar chu), at the caves representing Padmasambhava’s enlightened mind, where he entered retreat. As a result of this retreat, Namkhé Nyingpo accomplished the mahamudra vidyadhara through Shri Heruka. 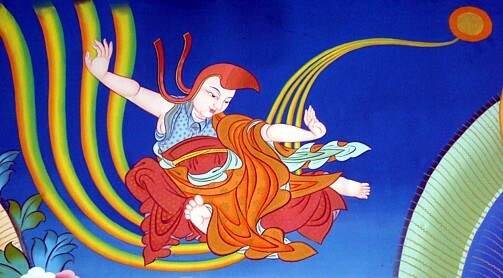 As a sign of his realization, Namkhé Nyingpo is said to have been able to fly through the sky, riding the rays of the sun and is thus often painted like this. Thus, Namkhé Nyingpo reached the same accomplishment as his teacher Humkara and becomes, so to speak, the Tibetan counterpart of the ‘Indian/Newar’ siddha Humkara. Following Samten Lingpa’s account, during his retreat Yeshé Tsogyal visited Namkhé Nyingpo and gave him the necessary instructions and empowerments to progress in his practice. Yeshé Tsogyal continued to stay at Lhodrak Kharchu practicing Dzogchen, during which time she recounted her life-story to Namkhé Nyingpo and Gyalwa Changchub, who wrote it down and concealed it as a terma-treasure. According to Pema Lingpa’s terma-treasure the Lama’s Jewel Ocean (Tib. Bla ma nor bu rgya mtsho), Namkhé Nyingpo, following a prophecy, met Shelkar Dorje Tso in her homeland in Shang Tanak (Tib. Shangs rta nag). There, Namkhé Nyingpo introduced Dorjé Tso to the practice of Shri Heruka through which she later gained siddhis. Namkhé Nyingpo introduced and ‘offered’ Dorjé Tso to Padmasambhava, as a result of which Dorjé Tso becomes Padmasambhava’s spiritual consort. Matthew Kapstein provides a translation of a short passage from a Dunhuang manuscript describing various miraculous light appearances during Namkhé Nyingpo’s death. As Kapstein observes, these light appearances closely resemble the descriptions of the death of masters in the Dzogchen tradition. Namkhé Nyingpo is most prominently known together with Kawa Paltsek as the compiler of the Lhenkarma (D 4364), one of the surviving translation catalogue of the first diffusion of Buddhism to Tibet. Besides this catalogue, the Tengyur preserves only one work (D 1678) attributed to Namkhé Nyingpo as a translator. This work—a sadhana dedicated to Shri Heruka—according to the colophon, was translated by Namkhé Nyingpo on orders of King Trisong Deutsen under the supervision of the work’s author Humkara at Nalanda. Given that Namkhé Nyingpo worked on the translation of the Sarvabuddhasamayoga literature it is peculiar that he did not include it in the Lhenkarma. The Nyingma Gyübum attributes two tantras, according to the colophon, dedicated to Shri Heruka to Namkhé Nyingpo as a translator. Accordingly, the tantra entitled Pal Heruké Tukyi Gyü Galpo (Tib. Pal he ru ka’I thugs kyi rgyud gal po) was revealed by Humkara from Uddiyana and in turn translated by Padmasambhava and Namkhé Nyingpo. And, the tantra entitled Heruka Galpo Chenpo (Tib. He ru ka gal po chen po) was translated by Vairotsana and Namkhé Nyingpo. The Pema Kathang states that Namkhé Nyingpo transmitted the following Shri Heruka texts to King Trisong Deutsen: 1. Yangdak Tsagyü (Tib. Yang dag rtsa rgyud), 2. Yangdak Lü (Tib. Yang dag lus), 3. Yangdak Tsongpa (Tib. Yang dag tsong pa), 4. Yangdak Phurdrakmé Drupthab Jé (Tib. Yang phur sbrags ma’i sgrub thabs rje). The Pema Kathang also ascribes the translation of six tantras to Namkhé Nyingpo: 5. Khakhor Dampé Gyü (Tib. Bka’ ‘khor dam pa’i rgyud), 6. Khorpo Metsek Metar Barwé Gyü (Tib. Khro po sme brtsegs me ltar ‘bar ba’i rgyud), 7. Jampal Sang Gyü (Tib. ‘Jam dpal gsang rgyud), 8. Ga’u Nakpö Gyü (Tib. Ga’u nag po’i rgyud), 9. Rolang Sang Gyü (Tib. Ro langs gsang rgyud), 10. Chitta Sang Gyü (Tib. Citta gsang rgyud). Furthermore, Namkhé Nyingpo plays an important role as a ‘co-author’ in the Nyingma terma tradition in which he either requested the terma teaching, such as in the famous Le'u Dünma, or served as a scribe such as for Yeshé Tsogyal’s biography. ↑ Another very prominent figure from the Nub clan of the same time period is Nupchen Sangye Yeshe. Sangye Yeshé is counted as one of the 25 disciples of Padmasambhava and is credited with having brought the Anuyoga teachings to Tibet. ↑ Jamgön Kongtrul Lodrö Taye, The Hundred Tertöns, translated by Yeshe Gyamtso, (Woodstock: KTD Publications, 2011): 40-41. ↑ It is unclear which specific languages Namkhé Nyingpo. It is likely that Namkhé Nyingpo knew Sanskrit, vernaculars spoken in India at the time and/or Newar. ↑ These five are: 1. Namkhé Nyingpo (Tib. nam mkha’i snying po), 2. Epagsha of Drugu (Tib. Gru gu e pag sha), 3. Vīra of Rugyong (Tib. ru gyong b+Ir), 4. Langchen Palseng (Tib. rlangs chen dpal seng), and 5. Gyalwé Lodrö of Dretsün (Tib. ‘bre btsun rgyal ba’i blo gros). Yeshe Tsogyal, The Life and Liberation of Padmasambhava, Vol. I & II, (Emeryville: Dharma Publishing, 1978): 472. ↑ Although we find mentioning of both an Indian as well as a Newar Humkara, Lo Bue suggests that the Indian and the Newar Humkara were the same. Thus, Humkara born in Nepal, later travelled to India and Nalanda. Later Humkara travelled to Samyé in Tibet. See: Lo Bue, Eberto, “The Role of Newar Scholars in Transmitting the Indian Buddhist Heritage to Tibet,” in Les habitants du toit du monde. Hommage ά Alexander W. Macdonald, (Nanterre: Société d’ ethnologie, 1997): 632. ↑ Jamgön Kongtrul Lodrö Taye, The Hundred Tertöns, translated by Yeshe Gyamtso, (Woodstock: KTD Publications, 2011): 40. ↑ Yeshe, Tsogyal, The Life and Liberation of Padmasambhava, Vol. I & II, (Emeryville: Dharma Publishing, 1978): 478 & 509. ↑ Ibid., 475-479. See also: Yeshe Tsogyal, The Lotus-born: the life story of Padmasambhava, (Boston: Shambhala, 1999): 83-89. ↑ Gyalwa Changchub and Namkhai Nyingpo, Lady of the Lotus-Born: The Life and Enlightenment of Yeshe Tsogyal, (Boston: Shambala, 2002): 160. ↑ Ibid., 162 & 208. ↑ Shang and Tanak are areas of south central Tibet, northeast of Lhodrak. ↑ Sarah Harding, The Life and Revelations of Pema Lingpa, (Ithaca: Snow Lion Publications, 2003): 99-114. ↑ Matthew Kapstein, “The Strange Death of Pema the Demon Tamer,” in M.K., ed., The Presence of Light (Chicago: The University of Chicago Press, 2004): 138-139. ↑ See the discussion above: The Translation of the Sarvabuddhasamāyoga Literature. ↑ Yeshe, Tsogyal, The Life and Liberation of Padmasambhava, Vol. I & II, (Emeryville: Dharma Publishing, 1978): 478. Almogi, Orna. “How Authentic Are Titles and Colophons of Tantric Works in the Tibetan Canon? The Case of Three Works and Their Authors and Translators.” In Contributions to Tibetan Buddhist Literature. PIATS 2006: Tibetan Studies: Proceedings of the Eleventh Seminar of the International Association for Tibetan Studies, Königswinter 2006. Beiträge Zur Zentralasienforschung 14, Ed. Peter Schwieger, Band 14, edited by Orna Almogi, 87–124. Halle: IITBS, 2008. Davidson, Ronald M. “Gsar ma Apocrypha: the Creation of Orthodoxy, Gray Texts, and the New Revelation.” In Eimer Helmut, Germano David (eds.). The Many Canons of Tibetan Buddhism. PIATS 2000: Tibetan Studies: Proceedings of the Ninth Seminar of the International Association for Tibetan Studies, Leiden 2000: 203-224. Harding, Sarah. The Life and Revelations of Pema Lingpa. Ithaca: Snow Lion Publications, 2003. Herrmann-Pfandt, Adelheid. “The Lhan kar ma as a Source for the History of Tantric Buddhism.” In Eimer Helmut, Germano David (eds.). The Many Canons of Tibetan Buddhism. PIATS 2000: Tibetan Studies: Proceedings of the Ninth Seminar of the International Association for Tibetan Studies, Leiden 2000: 129-151. Jamgön Kongtrul Lodrö Taye. The Hundred Tertöns. Translated by Yeshe Gyamtso. Woodstock: KTD Publications, 2011. Kapstein, Matthew. “The Strange Death of Pema the Demon Tamer.” In M.K., ed., The Presence of Light. Chicago: The University of Chicago Press, 2004: 119-156. Lo Bue, Erberto. “The Role of Newar Scholars in Transmitting the Indian Buddhist Heritage to Tibet.” In Les habitants du toit du monde. Hommage ά Alexander W. Macdonald, ed. Karmay, et Sagant. Nanterre: Société d’ ethnologie, 1997, 629-58. Roerich, George N. The Blue Annals. Calcutta: Royal Asiatic Society of Bengal, 1949. Szántó, Péter-Dániel & Arlo Griffiths. "Sarvabuddhasamāyogaḍākinījālaśaṃvara." In Brill Encyclopedia of Buddhism, Vol. I Literature and Languages, edited by Silk Jonathan A. Leiden: Brill 2015, 367-72. Tulku Thondup. Masters of Meditation and Miracles: Lives of the Great Buddhist Masters of India and Tibet. Boston: Shambhala, 2014. Yeshe Tsogyal. The Life and Liberation of Padmasambhava, Vol. I & II. Padma bKa'i Thang. rediscovered by Terchen Urgyan Lingpa, translated into French by GC Toussaint, and into English by K. Douglas and G. Bays. Emeryville: Dharma Publishing, 1978. Yeshe Tsogyal. The Lotus-born: the life story of Padmasambhava. Transl. Erik Padma Kunsang, ed. Marcia Binder Schmidt. Boston: Shambhala, 1999. This page was last edited on 4 January 2018, at 11:15.